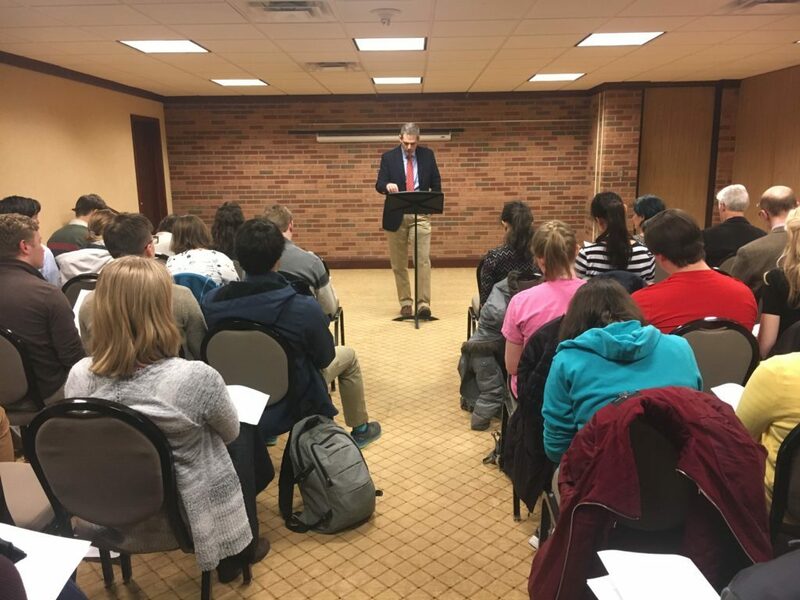 Assistant Pro­fessor of Edu­cation Jeffrey Lehman told stu­dents he planned to “begin with the end, put the beginning in the middle, and then end with the middle,” while explaining the virtues of a teacher on March 21 at an event hosted by the Hillsdale College Latin Teacher Program. Lehman started the lecture by explaining the two aims of edu­cation: wisdom and charity. Seen as par­allel ends, he said, one has to do with the intellect — wisdom — and one with spir­itual for­mation — charity. According to Lehman, wisdom in the clas­sical tra­dition plays a great role in the phi­losophy of edu­cation. This order is some­thing to which stu­dents should be con­stantly directed, and not just at the uni­versity level, Lehman said. “You seek it out as a way of under­standing God but also the world itself, dis­cerning structure in cre­ation,” Lehman said. Lehman then went on to discuss the the­o­logical virtue of charity, which “is the para­mount virtue that colors and directs all other virtues.”. Both wisdom and charity are the ends of edu­cation, according to Lehman. With that in mind, he dis­cussed the beginning of edu­cation: humility. Lehman said humility is important in teaching a student. A teacher should not dump “tremendous amounts of infor­mation on stu­dents,” he said. After beginning with humility, the teacher must be sus­tained in charity, according to Lehman. What comes in the middle are many virtues, some of which, Lehman said, are mod­er­ation, courage, kindness, and per­se­verance. “These are the kind of things we can model for our stu­dents and hope­fully encourage the stu­dents to hold them in their own souls as well,” he said. In regards to mod­er­ation, Lehman explained the dangers that can come with excess. Lehman made a point to mention the crucial nature of kindness in edu­cation. Shelby Bar­gen­quast ’19, who plans on pur­suing a career in edu­cation, said the event was a good reminder of the virtues nec­essary for a ful­filling career, espe­cially in the first year of teaching. Junior Joe Toates, who was in charge of the event, said Lehman’s talk was a good mix of the two sides of edu­cation.